In questa lotta interiore tra i propri bisogni di donna ed amare incondizionatamente il proprio figlio, risiede l’essenza dell’essere madre. In una ciotola lavorare brevemente le uova con lo zucchero, aggiungere l’olio a filo, l’estratto di vaniglia, il caffè freddo e l’acqua. Mischiare in una zuppiera gli ingredienti secchi (farina, cacao, lievito, bicarbonato, sale).Aggiungerli all’impasto alternandoli con il latte. Versare in stampi per muffins e cuocere in forno a 180° per circa 20-23 minuti. Sfornare e lasciar raffreddare. In un pentolino far bollire la panna con il glucosio e lo zucchero invertito. Spezzettare il cioccolato in una ciotola e coprirlo con la panna bollente. Attendere qualche secondo ed emulsionare con un mixer ad immersione. Aggiungere subito dopo la rimanente panna fredda. Coprire e lasciare in frigo almeno 12 ore prima di montarla. Montare la ganache e trasferirla in un sac a poche con la bocchetta a ciuffo. Coprire ogni cupcake con un ciuffo di ganache e lasciar cadere sopra i confettini. In this inner struggle between your needs as a woman and unconditionally love your child, lives the ‘being a mother’ meaning. In a bowl briefly work eggs with sugar, add oil flush, vanilla extract, coffee and cold water. Mix in a bowl dry ingredients (flour, cocoa, baking powder, baking soda, salt.) Add them to the mixture alternately with milk. Pour into muffin molds and bake at 350 F degrees for about 20-23 minutes. Remove from the oven and allow to cool. In a saucepan boil whipping cream with glucose syrup and invert sugar or honey. Break the chocolate into a bowl and cover with hot cream. Wait a few seconds and emulsify with an immersion blender. Immediately add remaining cold whipping cream. Cover with plastic film and leave in refrigerator at least 12 hours before using. Beat ganache in a bowl and transfer it into a pastry bag with the nozzle. 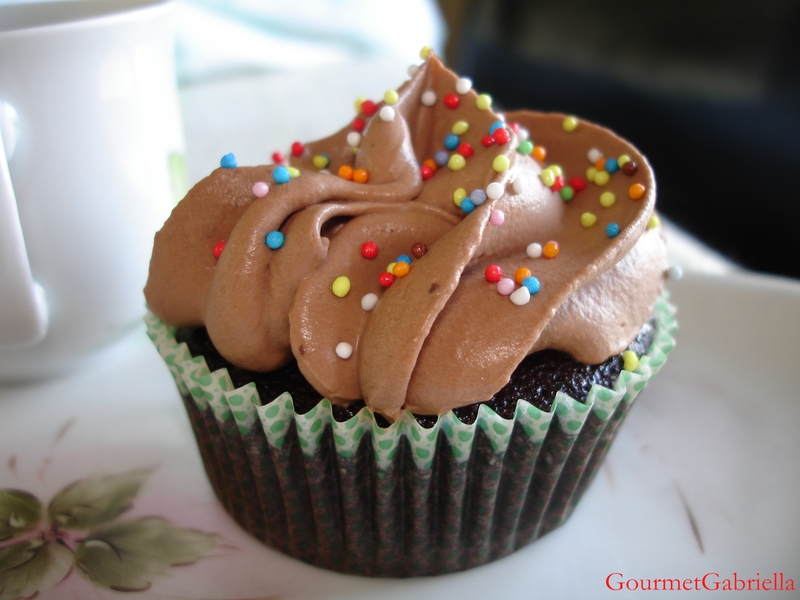 Decorate each cupcake with ganache and let it fall over sprinkles.